When I started writing Ruralise I had a list of things I wanted to cover. I thought it would be good for a few months, but as it’s turned out it’s taken me over a year to get the last few items on the list – one of which is a tale of two competitions. Both competitions were run with help from the RIBA Competitions Service and both, quite unusually (then, and still), concerned rural housing. The Jury Panel were particularly impressed by the layout, the emphasis on real sustainability in the use of design and materials and the successful way in which they incorporated elements of traditional Suffolk architecture. The project is certainly impressive in terms of its sustainable design – most notably featuring a very early use of hempcrete blocks – and the buildings themselves, in a de rigeur late-modern style, are nice enough – if not exactly shouting ‘Suffolk’. But I wasn’t so impressed by the site layout. The houses are arranged in short runs of terrace, aligned in parallel rows facing the sun, avoiding a traditional ‘fronts and backs’ arrangement – and much has been made of the variety of open spaces that result: private gardens, communal play areas, parking courts….parking courts: that was my over-riding impression, as my own photos record; they paint quite a different picture than the official portraits. Walking round the site I was put in mind of the rather abstract and aloof site-planning of S333’s otherwise-lovely housing at Vijhuisen, and even Walter Gropius’s density diagrams which I have discussed previously. This project, it seemed to me, owed much more to Modernist urbanism than to traditional rural or even suburban typologies. Interestingly, one of the other shortlisted schemes by Henning Stummel, proposed equally modish large-roofed terraces, but arranged in a much more familiar layout – three long terraces, with well-defined fronts and backs, defining a single large ‘green’. Parking was tucked away in two parking courts. The layout was evocative perhaps of traditional alms-houses or even mid-century sheltered housing schemes (such as Tayler&Green’s Windmill Green). Stummel’s layout is more ‘normal’, less interesting you might say, than the winning scheme – and I’m sure that would have counted against it in a design-led competition. I feel a bit mean-spirited – treacherous even – speaking ill of an RIBA competition winner like this, and I hope Riches Hawley Mikhail won’t take offence. Clay Fields is strong enough to take it, I think. Below: the site plans of the built scheme (left) and Henning Stummel’s design (right). 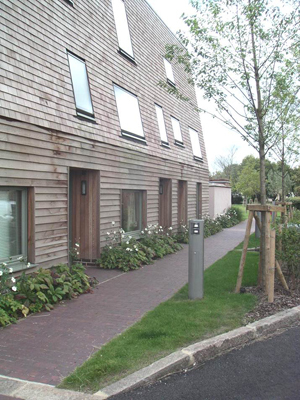 This entry was posted in Architecture/Design and tagged affordable housing, cars, Clay Fields, competitions, design/architecture, Emswell, Henning Stummel, layout, modernism, normal, orientation, RIBA, Riches Hawley Mikhail, Suffolk, Tayler and Green. Bookmark the permalink. Hi Henning. Nice to hear from you! Matt.